Looking for a USED V60R? 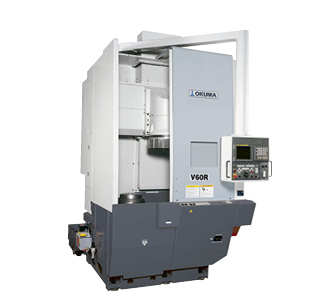 The V60 vertical lathe increases productivity by providing stable machining of thin and odd-shaped workpieces. The box-type base and column make a highly dependable, highly rigid structure and the headstock with flange construction minimizes the effects of thermal deformation and vibration - ensuring stable accurate cutting. The base is designed for smooth chip flow, and the optional chip conveyor can be placed for side or rear disposal to meet shop requirements. The ergonomical design includes easy access to the chuck and a front-skirt operation panel convenient for up-close jobs in addition to the swiveling pendant operation panel. Looking to Purchase a New OKUMA V60R?